Secretary of Education Betsy "The Federal Government Shouldn't Meddle In State Education Affairs But I Have This Policy I Really Really-- Oh What The Heck I Can Make Peace With Federal Overreach When It's In The Service Of Something I Want" DeVos has decided to get out there and stump for her Education Freedom Scholarships. For those of you late to this party-- EFS are one more shade of lipstick to be slathered onto the undead pig that is school vouchers. They exist in several states and, in fact, are sometimes quite profitable for the fauxlanthropists who donate to the funds-- plus, what they're "donating" is actually some of the tax dollars they owe to Uncle Sam. It's a clever dodge on several levels, but at root, it accomplishes what all voucher programs do-- it uses public tax dollars to help finance a private school education for a few select students. The private school in question is usually a religious one. Most folks seem to think that this measure, like much of the Trumpian budget, has little chance of becoming real. But DeVos actually ventured out into the world to try to pump it up anyway, and last week that meant trekking out to Iowa. She went to meet with Governor Kim Reynolds, who just a month or so ago was cheerfully proclaiming a Happy School Choice Week to Iowans. State Senator Bard Zaun (formerly a mayor and hardware store owner), stood with DeVos after the meeting; Zaun is a gun-toting, planned parenthood defunding, education privatizing Republican, and he has taken some heat for many of his proposed bills, with some critics seeing a connection between Zaun and ALEC. Sourcewatch finds that ALEC is pretty busy in Iowa, and reports that ALKEC members have contributed almost $20 million to Zaun since he first successfully ran for the Senate in 2004; those friends include the Kochs, Wal-mart, and the NRA. Zaun and DeVos sort of answered a couple of questions afterwards. The point that keeps getting made is that this voucher program will not take money from public schools, though when DeVos and her friends are making that point, they never say where the money will come from. We're talking about a total of $5 billion dollars in taxes that folks won't have to pay, $5 billion dollars that the federal government will never collect. That has to come from somewhere. And that's before we get to what ever companion law the involved states come up with to let people skip out on state taxes. 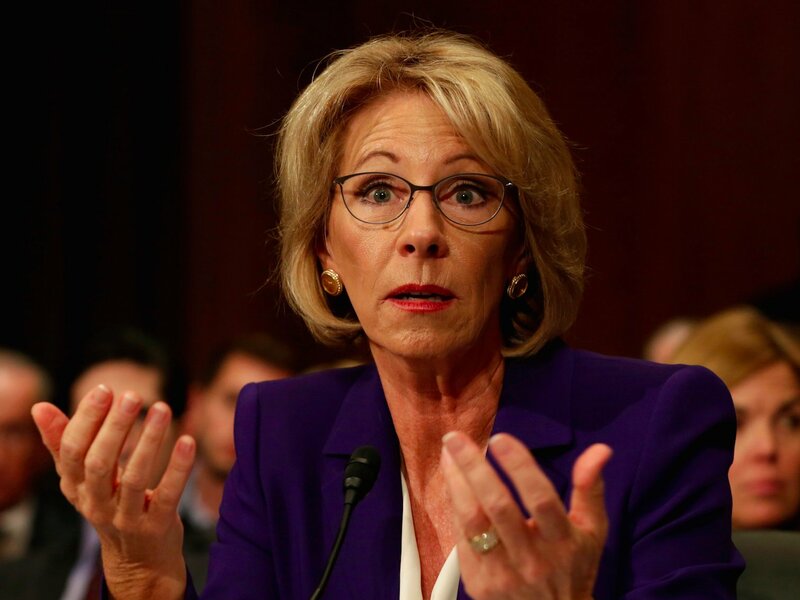 DeVos met with Reynolds, state legislators, education leaders, and lobbyists for faith-based and taxpayer organizations for a roundtable discussion not open to the public or media. Rep. RasTafari Smith, the top Democrat on the Iowa House Education Committee says he's disappointed public education supporters were not invited to the closed-door invitation only discussion arranged by DeVos' office. So only the cool kids got to be involved, because this is not about democracy or inclusiveness or functioning transparently as a high-level employee of the American people-- this is about using power and clout and connections to make sure that only the voices that you value carry the day. DeVos is nothing if not consistent-- she doesn't want to see or hear from supporters of public education, she doesn't want to explain herself to anyone not already on her side, and she really, really wants to give public tax dollars to private schools. At the moment, Reynolds and other Iowans have more serious problems to deal with. In the meantime, we'll have to see if DeVos has any more stops planned on her Federal Overreach To Privatize Education tour.